Anmar’s thermal imaging service is an innovative form of electrical component testing that minimises cost and maximises effectiveness and efficiency. Our service makes use of an infrared camera to produce infrared ‘heat pictures’. These images may then be analysed to determine whether certain aspects of your electrical circuitry are overheated or anomalous. A thermal imaging inspection is an excellent means of preventative maintenance. By detecting electrical faults before they expand into a full-scale malfunction, thermal imaging testing is fast becoming a necessary component of electrical maintenance. When electricity passes along a conductor or through an electrical component it can create heat. In instances where circuits are overloaded, or where high resistance joints are present (such as switchboards), it is possible that the heat generated by this electricity may cause damage to circuity or components. Electrical heat related malfunction can occur for a variety of reasons. If the problem is severe enough you will face an increased risk of electrical fire, amongst a host of knock-on detrimental effects to your system. 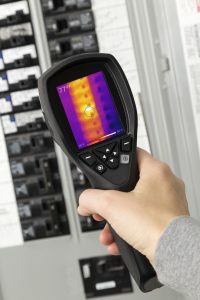 The predictive capabilities of thermal imaging assessments are a crucial component of electrical systems maintenance. By utilising thermal imaging techniques, Anmar Solutions is proud to offer an unparalleled way of pre-empting electrical system malfunction for its clients, thereby saving huge amounts of money in repair costs and loss of production. This enables an industry-leading standard of thermal imaging analysis of your electrical circuitry, whether based in switchboard equipment or general infrastructure. We provide transparent and compliant documentation and reports, as well as guidelines and advice on how to proceed should your equipment be faulty. Anmar provides access all the information you need to regarding your tests, including all documentation and support. Our customer service is first-class, and we always work with complete transparency. There are absolutely no hidden fees associated with any of our services. We offer Quality Assurance Reports.